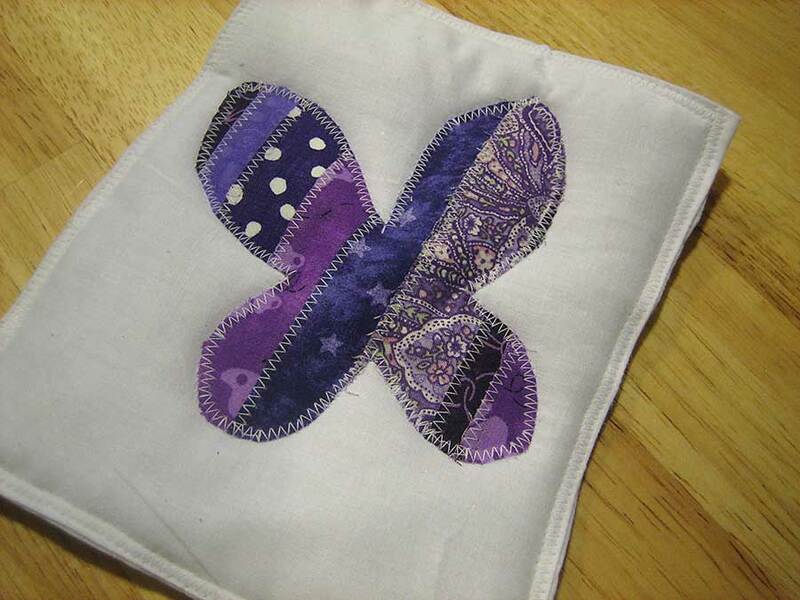 So, those butterflies I appliquéd onto the back of Boo's quilt? Would you like to know how I did them? There are many ways to appliqué. This is the way that I do it. I like it because it's quick, easy, durable, and doesn't require any materials other than fabric and thread. If you are putting together several pieces of fabric, I recommend sewing the appliqué piece onto a base fabric for stability. 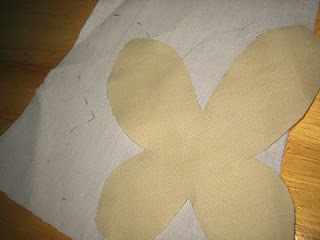 If you are appliquéing one piece of fabric onto another, you can skip the next few steps. 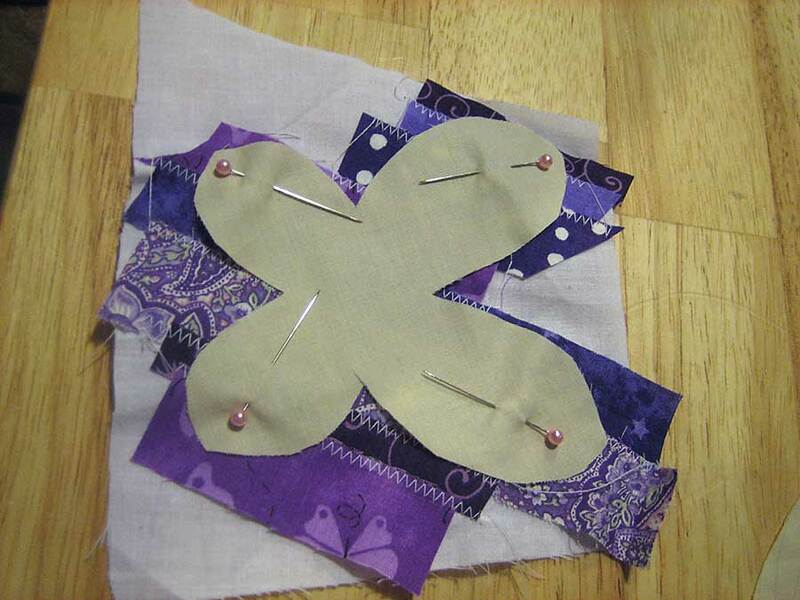 For these butterflies, you need thin strips of different fabrics. 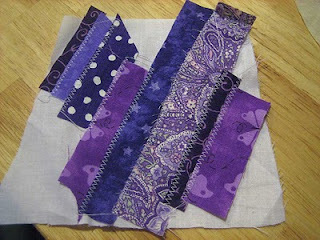 You will also need a base fabric--just any fairly neutral cotton fabric you happen to have. My strips are about one inch wide, and my base fabric is white muslin. First, draw your pattern onto your base fabric. I will put the templates at the bottom of this post, if you want to make these same butterflies. Even if you free-hand the design, you may want to have a copy to trace in a later step. Lay down your first two strips. Overlap your traced lines to be sure to completely cover the intended area. 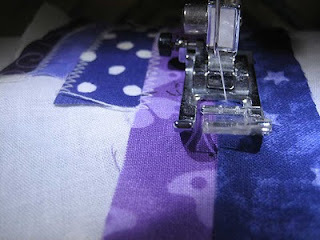 Also overlap the two strips by about the width of your zigzag stitch. This amount isn't critical; it just needs to be large enough for both strips to be secured by the one line of sewing. You can use a pin to secure the strips, but I just hold them in place. 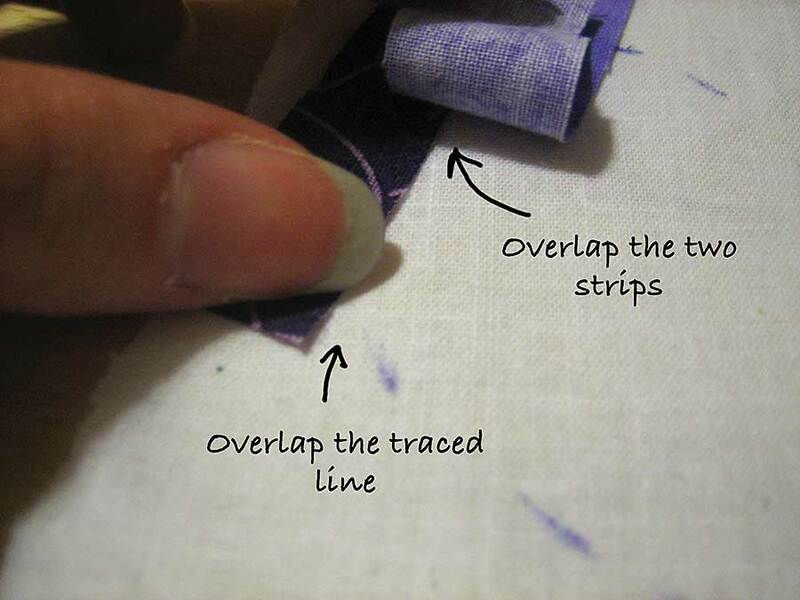 Now you use a zigzag stitch to sew your two fabric strips down. I use my machine's default settings for this stitch. You can make the stitches be closer together if you want. You can also play with the widths a bit, but don't make it too narrow--I've learned from experience that that isn't very secure. 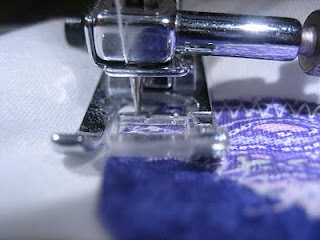 You want to sew just barely over the edge of your top fabric, to keep fraying at a minimum. Continue on until your stripes cover your entire pattern. 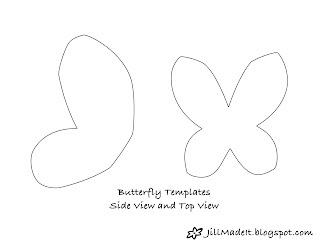 Now that your butterfly is fully striped, place the original template back on your stripes and cut out your shape. Put your appliqué patch where you want it to be. You'll probably want to pin it in place. Start on a fairly straight section of your design. You don't need to sew back and forth to reinforce this; you'll take care of that at the end. Remember to sew just barely over the edge of your appliqué patch. 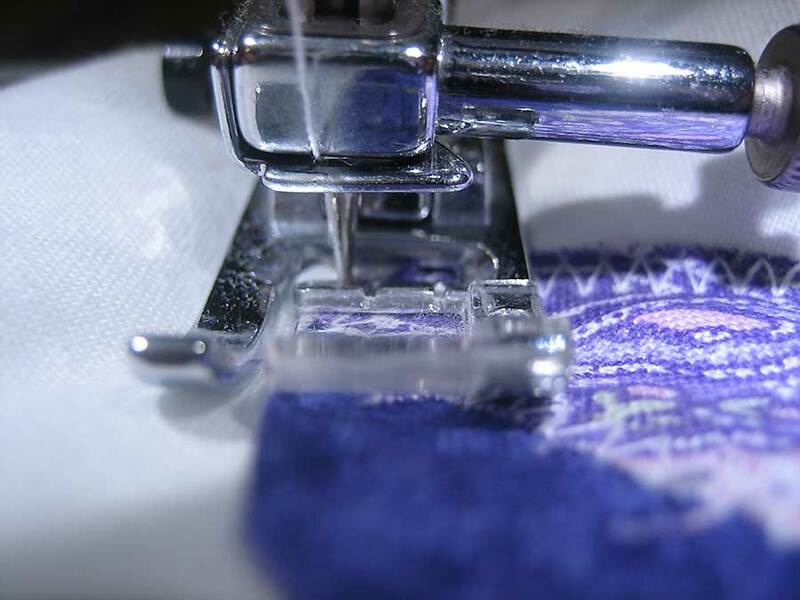 Once you've sewn all the way around your design, sew a little further, and backstitch a few stitches to lock the threads down. And you're done! That was pretty quick, huh? 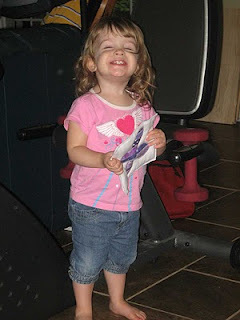 Since I wasn't blogging yet when I made Boo's quilt, I didn't take pictures of the process. So I needed to make another appliquéd butterfly for this tutorial. I decided to sew it onto a little pillow for Boo's dolls, and she was so excited when I told her what I was doing. She peered over the edge of my sewing table saying, "Me see! Ready yet! Ready yet!" That is a happy little girl.